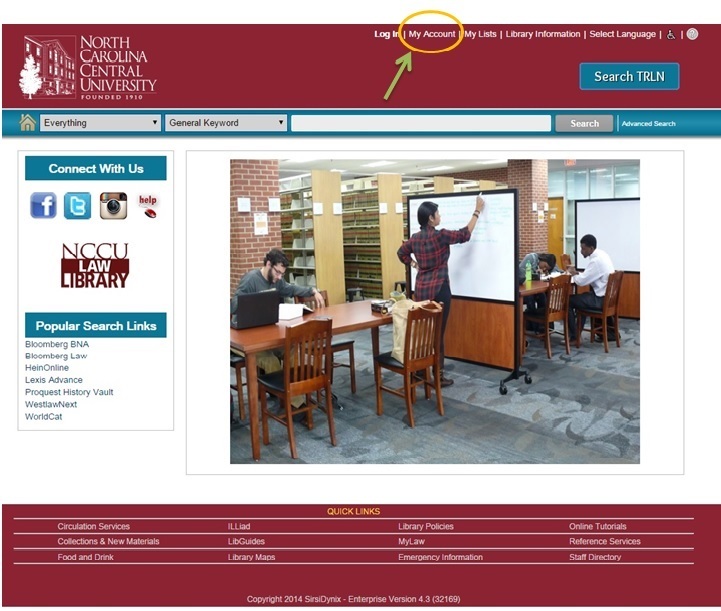 Current Faculty, students and staff at North Carolina Central University (NCCU) may borrow materials using their NCCU University ID card. Faculty, students and staff affiliated with the Triangle Research Libraries Network (TRLN), University of North Carolina (UNC) system schools, and North Carolina community colleges may use their school identification card to register for borrowing privileges. Visitors, including alumni, have access to library materials during Visitor hours. All materials must be utilized in the library. Please see the Service Desk staff for assistance locating resources. Library hours vary during holidays, exams, and between academic periods. Please call the Service Desk at 919-530-5189 for updated information. The loan period for circulating materials is four weeks. Students must have their Banner ID number in order to check out materials. Materials on the first floor of the library (state materials, reporters, etc. ); loose leaf materials, and serials do not circulate. If you are unsure if the item you want can be checked out, please ask at the Service Desk. Books may be renewed online by logging into MyAccount. If you've never used MyAccount before, take a look at the tutorial. Patrons may renew their books in person by calling the Law Library at 919-530-5189 and providing barcodes for individual books. Patrons may also renew books in person by bringing the items to the Service Desk to have them checked in and checked back out to them. This will also reset the number of times they can renew a book. *Please note that reserve materials can only be renewed in person and approval will be at the discretion of library staff to ensure equal access for all students. $20.00 is the maximum overdue fine charged for returned materials. Patrons are responsible for the books they borrow and will be charged for damaged or lost books. Books are automatically declared lost and the patron is billed when the item is 42 days overdue. Student fines and fees will be applied to the students’ Banner account for payment through the Bursar’s Office. Access to WestLaw may be suspended when Reserves items are overdue for 24+ hours. When books have been damaged beyond repair (including highlighting, underlining, or writing) or are known to be irretrievably lost, patrons may contact the Access Services Librarian to arrange replacement of the item. Replacement copies must be approved in advance. Patrons are responsible for any and all bills for late and/or lost items borrowed via the Law Library's Interlibrary Loan service, including replacement fines and fees charged by the lending library. Additional fees may be applied by NCCU Law Library for processing these charges. If you have any questions about fines and billing, please email Jonathan Beeker, Access Services Librarian, or call 919-530-6608. 2. 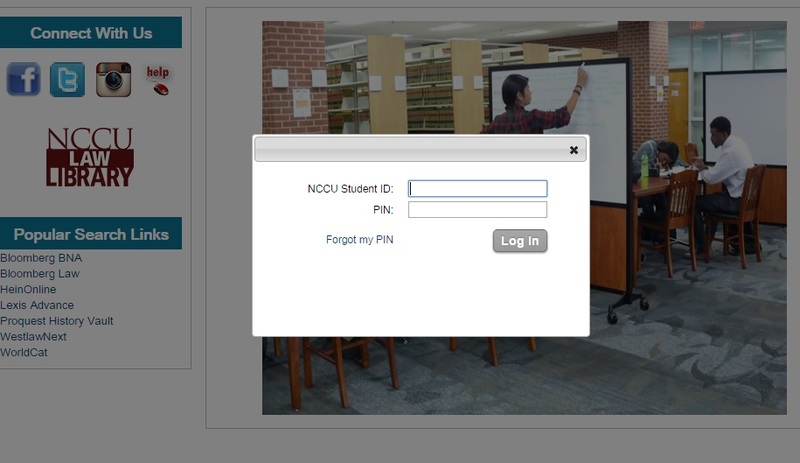 Sign into your account in the upper right corner of the screen with your nine digit NCCU Banner ID (820XXXXXX) and four digit PIN***. ***If you do not know your PIN number, you can call 919-530-5189 or go to the Service Desk to receive it. You can also reset your PIN online by clicking the Forgot My PIN link and following the email prompts to access it.